The 28.23 metre motor yacht Taurus has been listed for sale by Richard Higgins and Jeremy Comport at Camper & Nicholsons International. Launched by Riva in 2010 as part of the yard’s 92 Duchessa series, she was built from a GRP fast-planing hull and styled inside and out by Mauro Micheli of Officina Italiana Design. Accommodation is for eight guests split across four cabins including a full-beam master stateroom, a VIP suite and two twin cabins. Meanwhile, the crew quarters on this yacht for sale allows for a staff of up to five people. On deck, she offers various options for relaxing and entertaining, including multiple sunpads, an al fresco dining space back aft and a foredeck seating area with a built-in table that is ideal for enjoying an evening cocktail and a few snacks. The sundeck has been fitted with a barbecue and bar area just aft of the upper helm position. Moving inside through sliding glass doors, her main-deck saloon provides a relaxed ambience with three large sofas facing a flatscreen television mounted on a rise-and-fall mechanism. Further forward, her indoor dining area allows all eight guests to dine together around a rectangular table. Built for speed, she is powered by twin 2,435hp MTU 16V2000 M93 diesel engines with very low hours that allow for fast cruising at 27 knots, topping out at 30 knots. 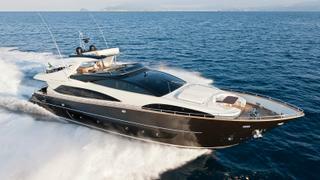 Taurus is asking €3,600,000 with VAT paid.